Beat the egg whites with the salt until stiff. Add half of the sugar and continue beating until the mixture turns glossy. Add the remaining sugar, lemon zest and juice, continue to beat until the mixture is fine-textured, glossy and very stiff. Carefully mix in the coconut flakes. Transfer the mixture to a piping bag with a serrated nozzle (approx. 10 mm in diameter), pipe 8 nests (each approx. 6 cm in diameter) onto a baking tray lined with baking paper. Place the meringues in the lower half of an oven preheated to 120°C, reduce the heat to 100°C and allow to dry out for approx. 1½ hrs. Then turn off the oven and leave the meringues to cool with the oven door open. In a pan, whisk the fruit juice with all the other ingredients up to and including the sugar. Bring to the boil over a medium heat, whisking constantly. As soon as the mixture thickens, remove the pan from the heat, add the butter and continue whisking for approx. 2 mins. Pour the cream into a bowl through a sieve, leave to cool, then cover and chill for approx. 45 mins. 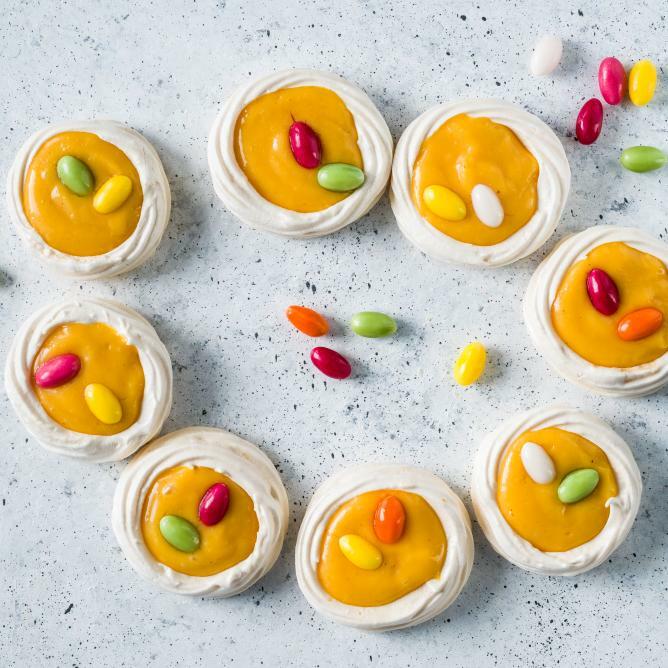 Stir the custard until smooth, pour into the meringue nests.